Pick the length that suits YOU! This woodland hike offers two choices, so both beginner and intermediate hikers can join in. “Tortoises” will enjoy a 2.2-mile loop around scenic Frick Pond, and the “Hares” will enjoy a brisk 4.1 mile hike. 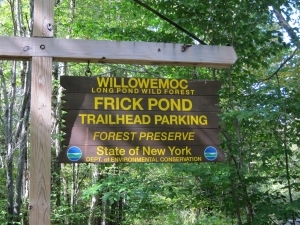 Both groups will head out together; then the Hares veer off halfway around Frick Pond, at the intersection known as “Times Square,” for 1 mile uphill on Big Rock Trail, followed by 1.7 miles of gentle downhill on the Flynn Trail back to the trailhead. We’ll try to arrive back at the trailhead at the same time! Pick the hike length that best fits your ability. TRAIL SURFACE: rocky terrain with some tree roots plus old woods roads that are easy to walk on. BRING: water, snack, camera, hiking poles if you have them! DOGS: this is a people-only hike; thanks for understanding. REGISTRATION: there’s a simple online registration form at www.catskillslark.org. Select Tortoise or Hare! CANCELLATION: if heavy rain predicted we will cancel. So please give us your contact into. QUESTIONS: If you have any questions about the hikes, feel free to call. We would love to assist!